Flex+ | Gesünder dank flexibler Elektronik - wie kann diese Technologie die Gesundheitsbranche revolutionieren? Healthier thanks to flexible electronics - how can this technology revolutionize healthcare? The contest has ended. But you can still submit your ideas and edit those that were sumbitted after the end of the contest. 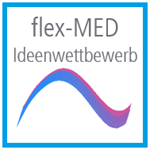 flex- MED - what is it? "flex" stands for flexible electronics – electronics that is lightweight and easy to shape. Flexible electronics can be bended and integrated onto various surfaces no matter how they are formed. "MED" stands for healthcare/medicine, the area where flexible electronics can soon play a crutial role. In our competition we would like to combine both areas in applications, products and concepts. The best therapy is an efficient medical care. How can healthcare advance through innovative diagnostic possiblities? What possibilities does flexible electronics offer when it comes to treatment of deseases. Examples of it are light therapy, diagnostics for the elderly, innovative implants or pflasters? The elderly would like to care for themselves as long as possible. Health monitoring and assistance systems will therefore assume a special role in the future. How can the quality of life be essentially improved with such systems? Flexible electronics offers a wide range of new possibilities. You will love it! Flexible electronics is light, flexible and easy to shape. At present, batteries, sensors, solar cells and OLED can be printed and evaporated on flexible substrates. This feature in combination with a subsequent deformation through folding, back injection molding or lamination can enable novel operation and application concepts. You can do without heavy and large components in flexible electronics. The printed circuit board becomes a thin and flexible film. Waiving of conventional components provides certain lightness for flexible electronics that influences the design and leads to the development of new products. Flexible electronics can be equipped with fascinated new light elements. OLED consist of layers that are 100 times thinner than a human hair. Through the free choice of shapes and flexibility, the luminous film fits on curved forms as a second skin. The intense, soft and area light can be used as an indicator or as an additional remedy for wound healing. The exciting OLED technology makes it possible to create transparent areas: This is how curved and shiny objects, as if made of glass, emerge. Flexible electronics can be potentially printed as a newspaper. There is no limitation in form or size. Flexible electronics combines innovative technologies. Low energy and resources consumption enables novel functional products. This results in a sustainable approach that preserves the environment. We are looking for innovative ideas that leverage diverse possibilities of flexible electronics. In this context we would especially value ideas that contribute to well-being, recovery and cure of patients. These could be also applications that measure certain health parameters, support the elderly in their daily routine or help kids to learn new skills. In short: We are looking for your ideas that combine “human needs” with flexible electronics. flex+ Open Innovation is a project funded by the German Ministry of Education and Science. The project is coordinated by the Fraunhofer Society, Fraunhofer FEP and Fraunhofer IAP, in collaboration with industrial partners. The flex+ consortium aims to foster flexible electronics in Germany and to transfer novel concepts into applications. Our jury will award three prizes: 1. Prize € 1.500 2. Prize € 1.000 3. Prize € 500 Three prizewinners will be invited to the Awards Ceremony at Fraunhofer FEP in Dresden. The prizewinners will be informed about further steps on September 1st, 2016. Please present you idea using no more than an A4-format. You can use pictures and videos to explain your idea. Is this an innovative idea? Have the properties of flexible electronics been taken into account? Have other properties, that still have to be developed, been mentioned? What is the benefit of the idea? Is the idea easy to understand and is described in detail? Has the contributor attached concepts and graphics? The Awards Ceremony will take place on September 28, 2018 at Fraunhofer FEP in Dresden within the Industry Partners Day 2016. Burkhard Dümler leads in his current role innovation projects related to wearables and future business models for adidas. He started his career at adidas 2012 and was responsible for the development of activity trackers, smart watches and fitness apps on all miCoach platforms. Previous assignments have been with Siemens-Mobile, BenQ-Siemens Poland and SIEMENS Healthcare USA. Burkhard has a Masters degree of computer science received 2001 from Albert-Ludwig University Freiburg. He is a known expert for agile software development and worked in his career as software developer, system architect, project manager, R&D manager and director development. since 2010 member of Senate at Technical University of Dresden. 2004-2012 panel reviewer at DFG. 2000 – 2006 Steering Committee at the Society of Anatomy. 1999 – 2003 Dean of research at the Medical Faculty Carl Gustav Carus Dresden. since 1994 Chair in Anatomy at the Medical Faculty Carl Gustav Carus Dresden. 2016 PhD - Dr. rer. medic. since 2013 Head of the Group Age+Technology. since 2012 Scientist in research group on Geriatrics at Charité: Project manager in various cooperative projects. 2009-2012 Project assistant in research group on geriatrics at Charité: coordinator in the project SmartSenior, coordination of the group Age+Technology, research in project SmartSenior. since 1993 Head of the Institute of Applied Photophysics, Technical University of Dresden. Research focus: organic semiconductors, from fundamental research to applications, e.g. organic light-emitting diodes, organic solar cells. His works have been numerously awarded with the Leibniz Prize of the German Research Society and the Future Prize of the German President. Prof. Leo co-founded several companies: Novaled AG and Heliatek GmbH. worked after training as Social Security Officer at BARMER in various positions. 1996 District Director at BARMER in Leipzig. since 2001 Regional Director at BARMER GEK Sachsen. Mark Matzas leitet seit 2015 das Technologiefeld in vitro Diagnostik und Bio Science im Technology Center der Siemens Healthineers und verantwortet dort die Entwicklung von neuen Technologien im Bereich Labordiagnostik. In der Zeit von 2012 bis 2015 war er in verschiedenen Rollen in der zentralen Forschung der Siemens AG (Corporate Technology) tätig, zuletzt als Forschungsgruppenleiter für Bio Science in Deutschland. Vor dem Eintritt bei Siemens bekleidete Mark Matzas verschiedene Positionen im Bereich R&D, Produktion und Support in der Biotechnologie- und Diagnostik-Branche. Mark Matzas ist Diplom-Chemiker und promovierte 2006 zum Dr. rer. nat. auf dem Gebiet der Molekularbiologie. since 2015 freelance coach in risk management, management systems and auditing. since 2014 Lead Auditor at TÜV SÜD; Focus: Active medical products, certification and management system audits. 2011-2013 Team Manager „Hybride Energy Systems“, RLI gGmbH. 2007-2011 Scientist TU Dresden; PhD in Organic Electronics. PhD Award in „Green Photonics“ 2012 und Science Prize 2012 des UMSICHT- Association. before establishing his company Sebastian Wolfram was working as engineer in various position in car design in Germany and abroad. 2006 WOLFRAM Design/Engineering was established. WOLFRAM Design/Engineering is active in industrial design and develop-ment of medical products. Sebastian Wolfram has been also responsible for the development of the first OLED luminaires ready for serial production as well as applications in flexible electronics. His achievements were distinguished with various international design prizes, Inventions Geneva, Plus X Award, and the German Design Award 2015. The terms and conditions for the ideation contest can be found here. If displayed in German, please switch to English using the globe icon in the top navigation. All rights for content posted within the framework of this ideas competition, including the winning ideas, remain with the idea giver.